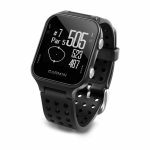 The Garmin Approach S20 is a golf-themed smartwatch designed to help players improve their game. It uses a unique �CourseView� system to update and analyze frequently played courses � with over 40,000 worldwide courses pre-installed. You can see your exact location on the course and the distance to the green. The Approach S20 also tracks fitness and health stats, and will display smart notifications for calls, texts, and more. It comes in three colors: black, white and blue. You can also keep your score on the watch while you play.